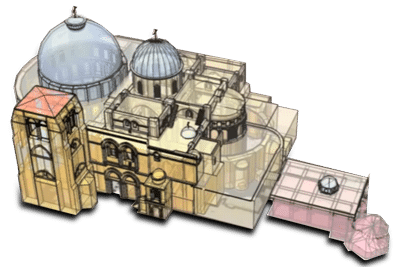 The Church of the Holy Sepulchre is located in the heart of the Old City of Jerusalem and contains within its walls the most important places for Christians from all over the world, the Holy Places par excellence: Calvary and Christ’s Tomb. Reflecting its fundamental importance for all of the Christian churches and communities, in many ancient traditions it was defined as the “center and navel of the world”. In 1342, with the approval of Pope Clement VI, the Franciscans of the Holy Land were given the responsibility of caring for a number of places within the church, in the name of the Latin Catholic Church. 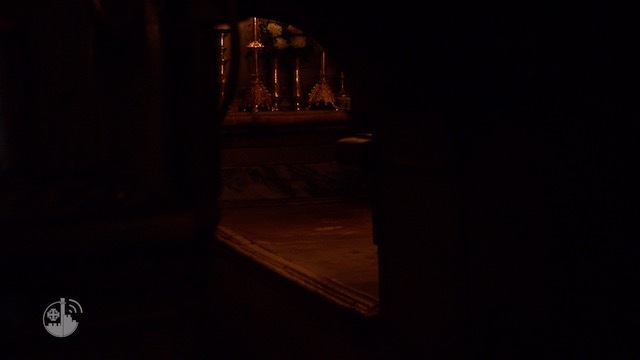 Accordingly, since that time the Franciscan friars have served as the custodians of this Holy Place and they continue to work, alongside the other Christian communities present in the church, so that pilgrims from all over the world can visit, celebrate and pray in the Places where Christ’s death and resurrection took place. To promote a better understanding of the architecture and the events that took place here, and embodying the spirit and values of the Custody of the Holy Land, ATS pro Terra Sancta is actively involved in the communication and enhancement of the church, which each day is visited by multitudes of pilgrims. Two videos have been produced giving everyone the possibility to deepen their knowledge of the history and art of the church: “A Virtual Visit to the Church of the Holy Sepulchre” and Watch the videos! ATS pro terra sancta has published a guide book, a flyer and some art products, usefull for the pilgrims, and for who visits the Church and wants to bring home a memory.